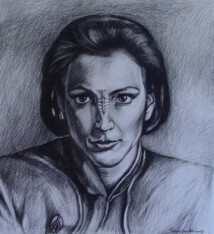 In August 2000, FBTS, the fanclub of Nana Visitor and Alexander Siddig released a Kira Nerys fanzine entitled Orb Visions. Three of my drawings were published in this zine and I have included them on this page so you can see them in a digital format. I really enjoyed making these pictures because Nana's face is so wonderfully expressive. I hope you enjoy them too. This drawing is made from many subtle lines overlaid one on the other. It took many little adjustments, repositioning and often erasing whole sections to find the tense and focussed expression on Kira's face. "Kira Initiation" from "Initiation" a short story by Roden Rhiyan. Roden Rhiyan's story of Kira's abduction by the Pagh Wraith cult had some very strong images. The one I chose was that moment when Kira has the Pagh Wraith earring forced into her ear. I didn't want to draw the physical violence of that moment, but rather the sense of entrapment and darkness that descended over Kira. Her face is stoic, almost stately, as if to say that her inner strength alone was enough to repulse any idea that she might be seduced by the Pagh Wraith Cult. "Kira Springwine" from "Springwine" a short story by Roden Rhiyan. A drawing in a much lighter vein. It was challenging to portray this romantic and intoxicated moment between Kira and Sisko. The picture is composed from many different images montaged together to form a composition. I found the very "Quarkish" glasses on a dusty shelf in a local shop. In real life they are a deep blue, just like the ones that appear in DS9. A lucky find! Orb Visions can be purchased from FBTS, Gayle Stever P.O.Box 11261, Scottsdale AZ 85271-1261 USA. Hopefully, Orb Visions Vol.2 will appear next year. Spare moments will generally find me ensconced in my studio, happily drawing and painting. Being a fan of Nana has proved to be a creative and inspiring experience for me. To Nana and all her fans in FBTS, Peldor Joi! The characters and places herein belong to Paramount Pictures,Inc. The illustrations however are mine. They are published here for the personal enjoyment of fans and may not be republished without permission..